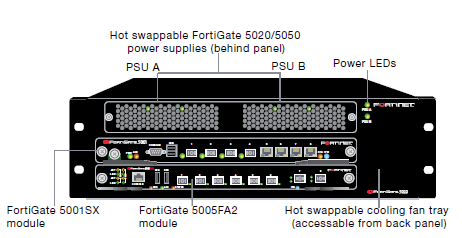 FortiGate 5000 series appliances give you the ability to deploy a wide range of Fortinet’s UTM inspection capabilities, including firewall, IPS, application control, VPN, and web filtering. These features can be scaled as required by adding more security blades. Each system also supports FortiGuard® security subscription services to deliver dynamic, automated updates and ensure up-to-date protection against sophisticated threats. 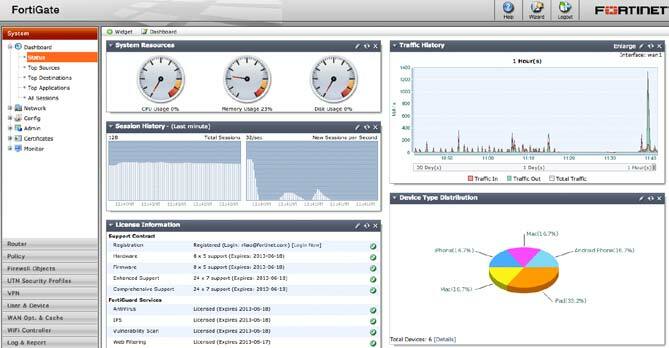 In addition, the devices support a web-based GUI, ‘single pane of glass’ management console, and on-board reporting. 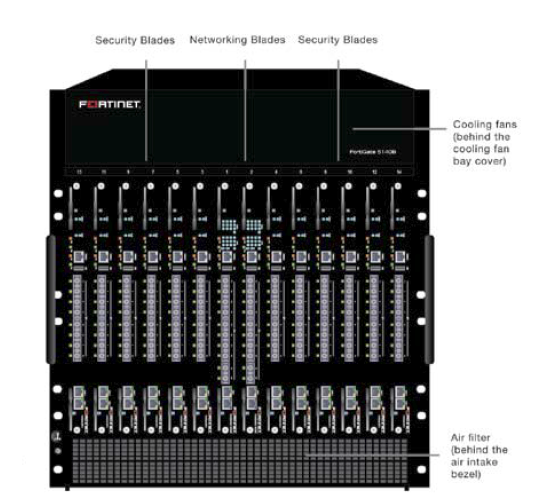 Up to two networking blades may be installed on a FortiGate 5060, FortiGate 5140B and FortiGate 5144C on designated slots. These blades connect the system to the network while connected to the multiple security blades via the chassis’s backplane. The networking blade clusters the security blades with traffic distribution. 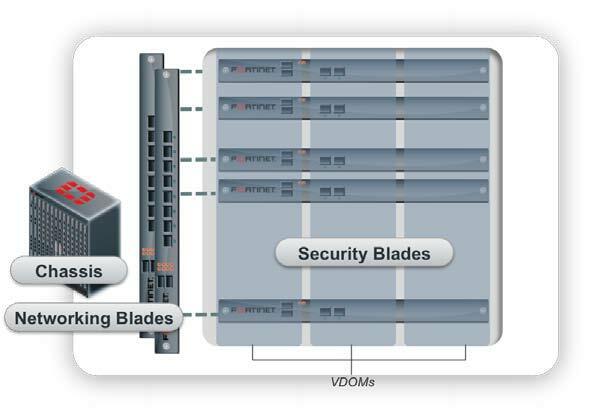 Networking blades can assign security blades into service groups which are isolated clusters coexisting in a single chassis. Two networking blades may either operate as activepassive HA or separately with its own clusters. Firewalls alone aren’t enough to block today’s blended threats and attacks. Data centers require multi-layered security technologies that examine entire packet flows, from content inspection through reassembly, stopping threats at the perimeter. The FortiGate 5000 series offers this critical functionality without compromising performance and scalability. Based on industry’s conforming standards assuring carrier-grade performance, reliability, 99.999% availability and serviceability. 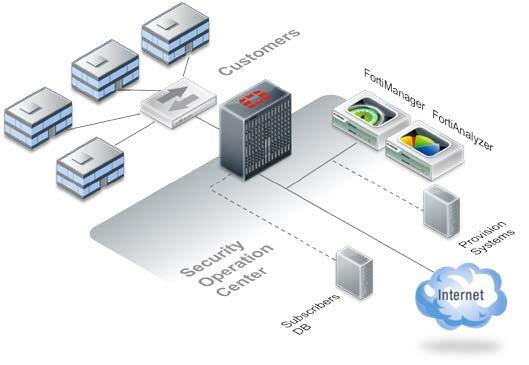 FortiOS Virtual Domains (VDOMs) is a proven method of dividing a FortiGate unit/cluster into two or more virtual units that function as multiple independent units. It has the industry’s most comprehensive virtualization capabilities that meet today’s complex MSSP deployments. 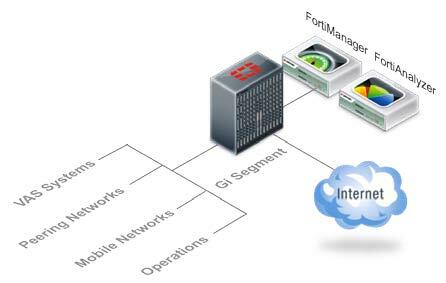 FortiOS supports numerous network design requirements and interops with other networking devices. This includes support for a wealth of routing, multicasting and network resiliency protocols. Administrators can also configure interfaces for VLANs, VLAN trucks, port aggregation and one-arm sniffer mode. FortiOS supports both local and remote authentication services such as LDAP, RADIUS and TACACS+ to identify users and apply appropriate access policies and security profiles accordingly. It may also simplify identitybased implementations and also provide seamless users authorization experience with various single sign-on capabilities. One such application is to retrieve subscriber’s information via RADIUS accounting messages and apply appropriate security services dynamically for a managed service provider. FortiOS has strong PKI and certificate-based authentication services and also integrates an internal two-factor token server for additional security. The FortiGuard IPS subscription service provides FortiGate customers with the latest defenses against stealthy networklevel threats. With signatures of more than 4000 known threats, it enables FortiGate to stop attacks that evade conventional firewall defenses. It also provides behavior-based heuristics, enabling the system to recognize threats for which no signature has yet been developed. It is common in service provider and data center networks to have hundreds, if not thousands of security policies, hence to be able to manage these policies effectively is critical to minimize configuration errors and complexity. FortiOS has the unique ability to provide two forms of policy management views — Global and Section view helps administrators to choose an option that they are most familiar with or suit their requirements best. It also provides powerful features such as policy object search, tagging, sorting and filtering. Policy objects can easily be edited from the policy table. With FortiManager integration, customers may also have the ability to setup sophisticated policy implementation and provisioning workflows for compliance or operation requirements. Detailed configuration audit trail is supported and can reside externally for secured storage with FortiAnalyzer. Maintaining security for both IPv4 and IPv6 traffic will be crucial to the success of mixed networks. Malware and network threats are independent of IPv4 or IPv6. FortiOS is able to use IPv6 security policies to provide access control and UTM protection for IPv6 traffic. FortiOS has been successfully evaluated as compliant with core protocol and interoperability tests defined by IPv6 Ready Logo Phase 2. 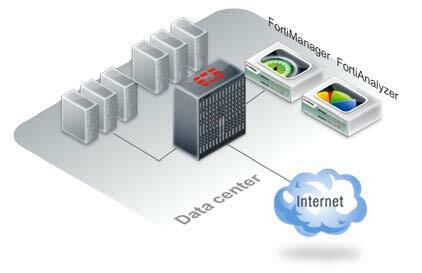 Download the Fortinet FortiGate5001C Data Sheet (PDF).